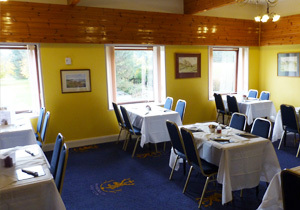 The Restaurant caters for members and guests, non-members are also welcome to use the bar and restaurant facilities. Our caterer, Stevie Duffie of The Wee White Dog Catering Company serves fantastic food throughout the day from a menu featuring traditional favorites as well as light snacks. Why not pop in and check out Stevie's Menu. Bookings can be made by telephoning 01324 711500.